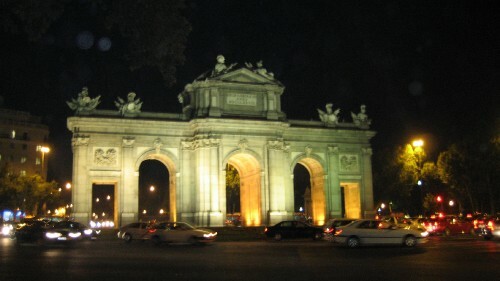 Well I have just returned to Madrid, for my second extended visit. Like always, when leaving home, I did not want to go. I wanted to cancel my flight, drop out of school and stay home in San Luis Obispo forever. However, I felt the same way at the end of the school year - I wanted to change my major so I didn't have to go to Spain and I wanted to stay in New York. . .and also, when I left Spain in December. . .I wanted to quit water polo and stay in Spain for a year. In short, these feelings were perfectly normal. But as soon as I got in the taxi and headed home (my Spanish home) I couldn't have been happier. I could not believe I was already back in Madrid; it was like I had never left. And my Spanish still wasn't half bad, either! It's really great to see familiar things and have the assurance that I more or less know a place. . .! I definitely recommend Swiss Air. Security in Zurich was a breeze, and my experience in that airport was nothing like my hellish two days in Heathrow last December - though I did get to stay in a nice hotel and meet some pretty cool people. Only a 10 minute or so delay in Zurich, AND I also got ALL my bags almost immediately upon disembarking the plane! From California to Zurich, the seats were comfortable. . .they give you FREE food AND DRINKS (alcoholic). . .quite a nice change from the 5 dollar snack boxes and 10 dollar glasses of wine (may be exaggerating about the wine) on United/British Airways. And. . .it gets better. You can play video games, compete in trivia games with other passengers, watch videos at your leisure, and see video footage off the nose or below the plane! It's sooo coool!! I think I will fly Swiss Air wherever I go. . .even if it means flying through Zurich to get to Hawaii. . ehm. . hah.